By Alexis Leon & Mathews Leon, Leon Techworld, 1997. 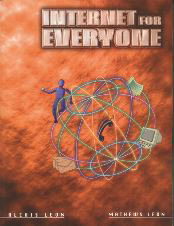 This book introduces the basics of working with the Internet, primarily for people who will connect to Internet by phone. You will learn what Internet is and how to use it from your computer. Along the way fundamentals of Internet and the World Wide Web (WWW) like Internet addressing, different communication protocols, web browsing, etc., the important ideas and concepts that often bog down and discourage newcomers, are introduced in a simple and easy-to-understand fashion. This book fully explores the tools and technologies that are necessary to get productive on the Net. Topics like ‘How to surf the net more effectively?’ ‘How to conduct a search on the net?’ ‘How to create your presence on the Internet?’ etc are given a thorough treatment. You will soon find that Internet does not stand still; but the topics covered in this book will give to everything you need to get started and gain some degree of comfort with Internet and you can take off from there. This book will get you started in the Internet world and will give you enough ammunition and firepower with which you can continue your journey through cyberspace and explore its new advancements and technologies.